DEREVO’s tour plan has been updated recently with some new dates and options particularly for performances in Russian Far East. HARLEKIN will be played in Vladivostok and Khabarovsk and optionally in Ekaterinburg. The dates for HARLEKIN performances in St. Petersburg have been confirmed as well. Please don’t miss the appearances of DEREVO with the critically acclaimed HARLEKIN in Subotica (Serbia) and Budapest (Hungary). 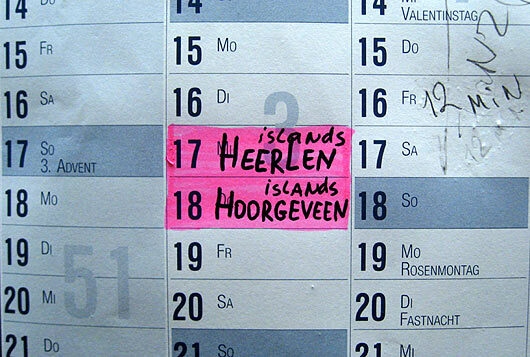 An appearance in Antwerpen (Belgium) has been confirmed for the February 2011. Акция в Секретном Бомбоубежище в Москве Где Штык в Детстве Вывихнула Ногу - не состоится. Не хотим повторения инцидента. Показ фильма «Юг.Граница» и встреча с Антоном Адасинским. Ответы на рискованные вопросы языком и телом. Антон танцует Дроссельмейера в “Щелкунчике” (постановка Михаила Шемякина) в Мариинском театре. Шестидневная акция “Евангелие от Антона” - клуб “Антресоль” (Малый пр. В.O., 49). 20 и 21 марта состоится мастер-класс Антона Адасинского в театре «Люди Дождя» (Мончегорская ул.,10б). Сольная акция Елены Штыковой «Тула» - клуб «Антресоль» (Малый пр. В.O., 49). Photo: Elena Iarovaia, Hideo Tanaka, DEREVO & others. We dreamed five dreams, fragments I’ll try to tell. A doctor’s room. The right hand must be amputated. The question is – what should be left? They suggest some stump. I don’t like the idea. I don’t want to have anything at all up to the shoulder. So it would be much more theatrical. During the discussions I cannot stop myself gazing at the view behind the doctor’s back. There is a hole in the wall and there is a stage. I see KETZAL. Di is dancing in place of me. I weep. She’s lying sideways in a puddle. The water is soft and oily. She doesn’t dare to raise her head, because her face will remain in the water. flies amidst the raindrops and with the same speed. Di is driving some airplane. The gunner is pressing his back against the back of Di. They are like Siamese twins. They fly somewhere in the night. 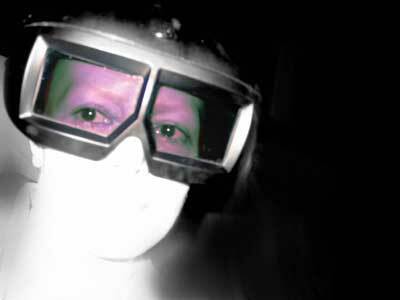 Suddenly – it becomes very bright all around – they are caught in a ray of light. Then – waiting for the shot. The back of the fellow becomes warmer. Alisa fell asleep in a bath, frozen and remembers no dreams. Max was looking for the keys. 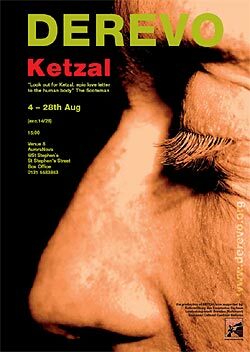 We perform KETZAL from 4 till 28 August. You’re welcome. Wir treten mit dem Stück KETZAL vom 4. bis 28. August auf. Karten sind hier zu kaufen. Мы показываем “КЕЦАЛЬ” с 4 по 28 августа.